Can you believe it’s Wednesday already? Where’s September rushing to? Anyway, in my most recent post I mentioned that I had lost some pictures that I took of some natural hair products that I bought last week. Without further ado, I’ll just go on and show them to you all. From left: Ajani Handmade Rosemary & Peppermint Essential Oil Elixir; Thai Coconut Milk; Tresemme Thermal Creations Heat Tamer Leave-In Spray; Navida Natural Foods raw 100% Virgin Coconut Oil; Alberto Balsam Coconut & Lychee Conditioner; Tresemme Naturals Nourishing Moisture Conditioner with Aloe Vera & Avocado; Awali Naturals Golden Butter and Creme of Nature Moisture & Shine Sulfate-Free Shampoo. 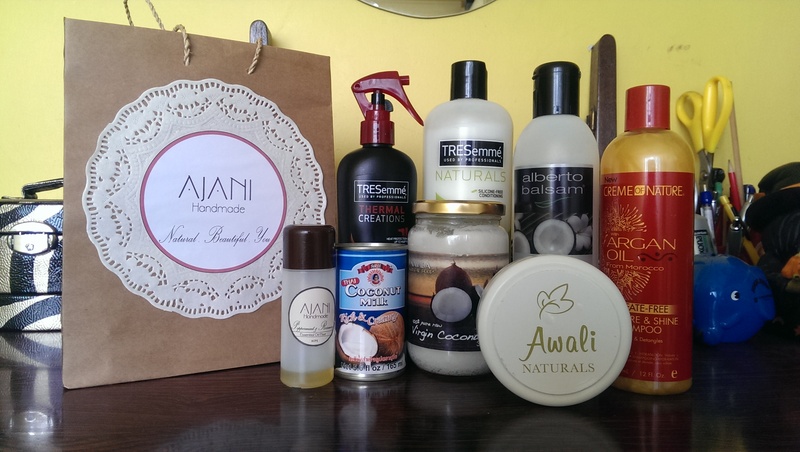 I bought all the products from various Nakumatt stores (Prestige, Junction, Lifestyle) and the Ajani and Awali Naturals products (both Kenyan brands) at a natural hair meetup. I’m looking forward to trying out the rest of the products, and particularly using the coconut milk and Tresemme Naturals conditioner!